Hogarth gained popularity for his morality paintings and the prints that were made from them though he also produced work in a variety of other genres including portraiture and biblical/historical pieces. 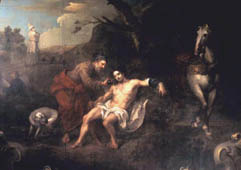 The artist was heavily influenced by 18th century life, culture and his middle-class upbringing. He believed that art should have moral as well as aesthetic qualities and tried to bring this into all the work he produced. His series of moral paintings, such as A Harlot's Progress and A Rake's Progress took a satirical look at the government and social scene of the day, and highlighted the best and worst parts of English culture. 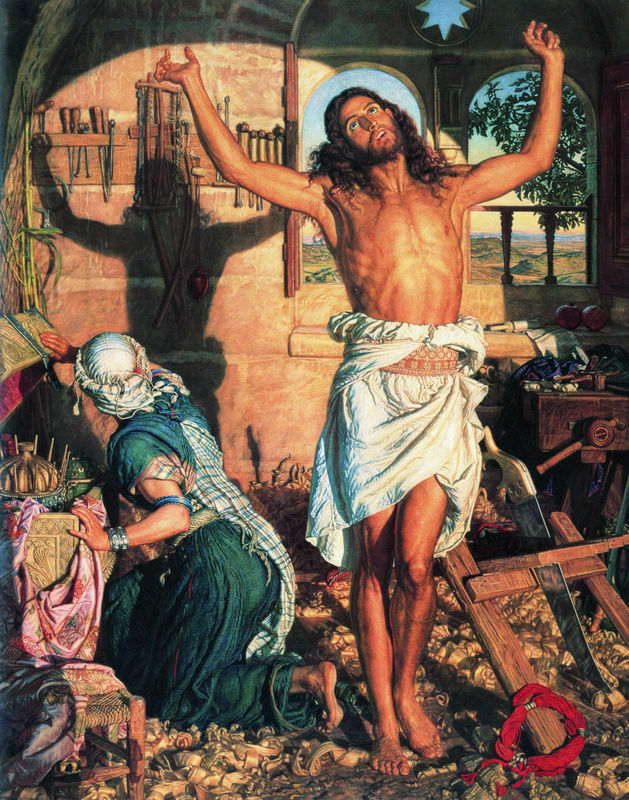 In the 19th century the Pre-Raphaelite brotherhood was inspired by Hogarth's use of symbolism and text to convey a moral message. However it is possibly the biggest testament to the artist's skill and wit that the new medium of the comic strip arose from his work, a genre which is still popular today. 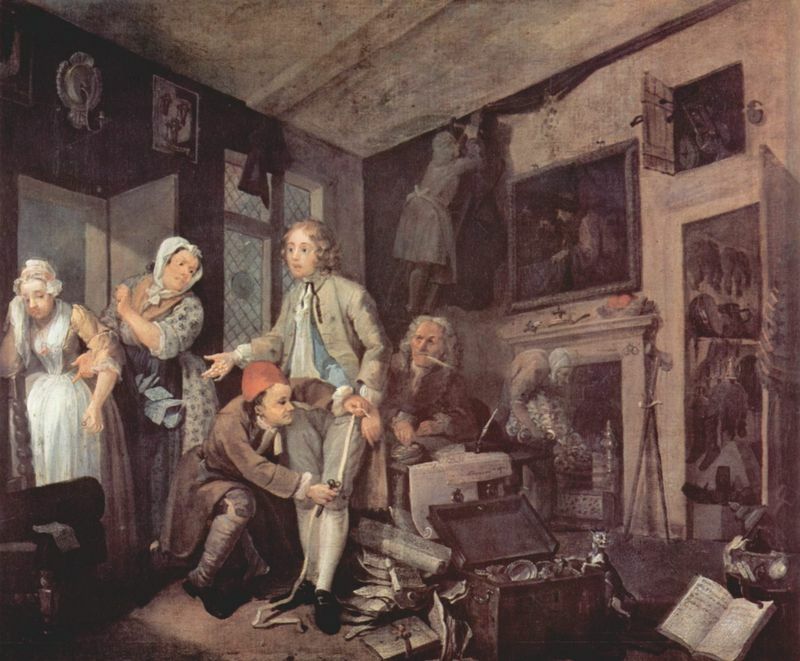 William Hogarth was born in 1697, a time of social and moral depravity. At the turn of the 18th century, however, London began to bloom creatively and William Hogarth was at the heart of it. Born into a poor, middle-class family, Hogarth started work as an apprentice of Ellis Gamble, a plate engraver, at the age of 16. He developed his artistic skills by later attending Sir James Thornhill's Academy of art in London's Covent Garden. 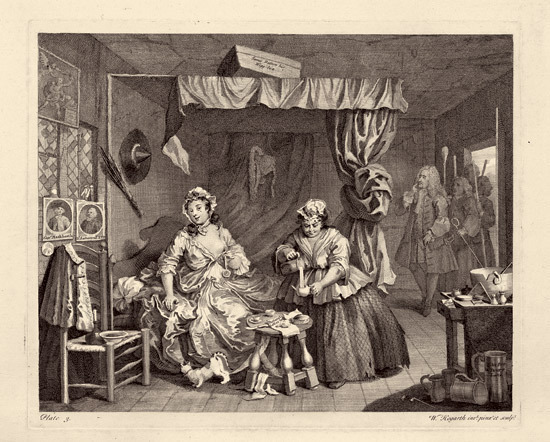 During the 1720s Hogarth continued to make a series of engravings of scenes from popular theatre shows, demonstrating the earliest signs of the satirical work to come. From 1731 onwards, Hogarth produced what was to become known as his 'modern morality' paintings. These were specifically designed to be copied in large numbers and sold as prints to members of the public. Between 1740 and 1745 Hogarth focused on portraits and received commissions from the rich and influential elite of London society. In 1748 Hogarth created The Roast Beef of Old England after an eventful trip to the French port of Calais. After entering the port as a tourist the artist began sketching the fortifications. This drew the attention of the French police who accused him of being a spy. On his return to England Hogarth painted less than flattering political paintings about the French, perhaps reaffirming his distaste for the continent. Hogarth was at the height of his career at this point and was making a good living from his printed works and portraiture. 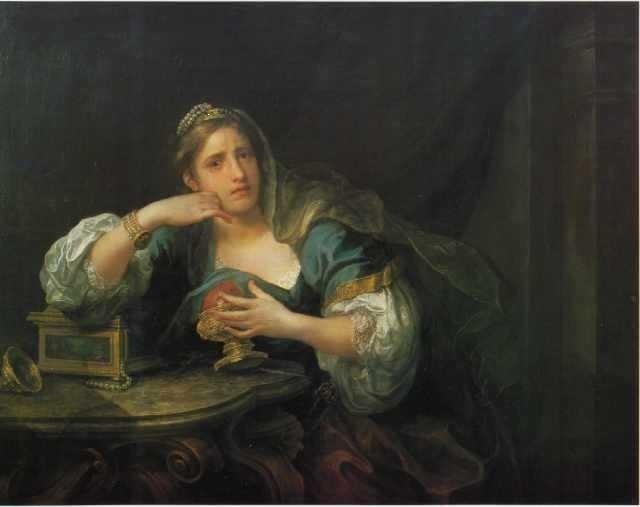 He then tried his hand at historical painting but this venture wasn't very successful and he received a lot of criticism for attempting something which many of his contemporaries believed was above him. In 1762 Hogarth published an anti-war satire 'The Times' which caused outrage from one prominent MP in particular, John Wilkes. He published a scathing article dismissing Hogarth's work in his newspaper The North Briton. 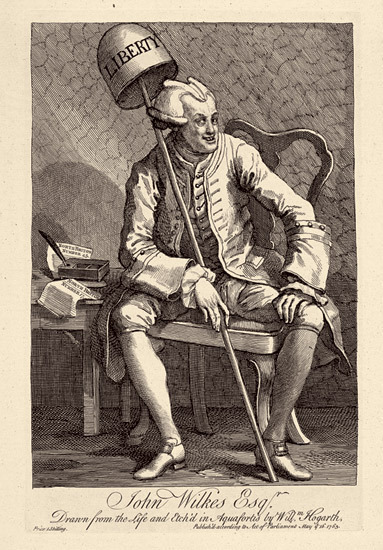 In response Hogarth created an engraving, John Wilkes Esq. showing the MP wearing a symbolic cap of liberty in such a way that it appears to be a halo along with a wig shaped like horns. In July 1673, not long after printing the John Wilkes Esq. engraving, Hogarth suffered from a paralytic seizure and became seriously ill. He passed away in London in 1764 at the age of 67 and is buried in Chiswick cemetery. He left no children. Hogarth was a trained engraver in the Rococo fashion and his art contained strong remnants of the Rococo style. Hogarth's work often focused on what was happening in 18th century London and the foibles, scandal and political events of the day. Hogarth's use of color is usually confined to a warm palette featuring reds, yellows and ochre. The artist often used large amounts of brown and dark blues in order create shadow and movement within the piece. Frequently creating busy canvases, Hogarth used a range of different characters to display a narrative within the painting. Hogarth's technique could be described as the embodiment of the Rococo style. In his portraits and historical paintings he uses lose, flowing strokes. The principals of this work also relied heavily on what Hogarth described as 'the Line of Beauty', the serpentine line which was incorporated into much of his work. 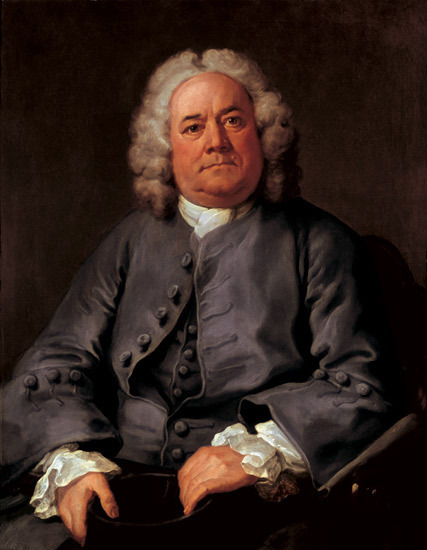 During his youth, Hogarth was heavily influenced by his father's classical education and the teaching he received from it. He also used to visit an artistic neighbor and sketched there regularly. 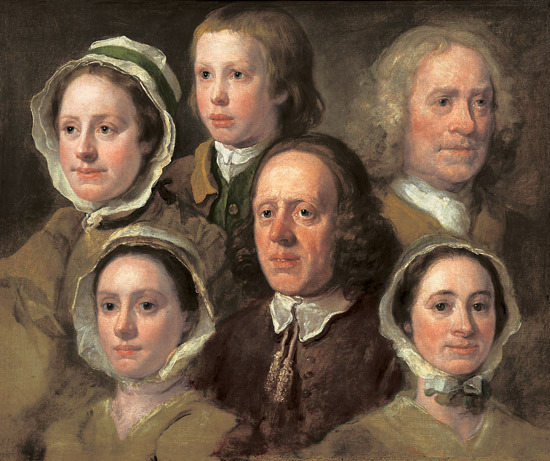 His family's Puritan religious beliefs relayed a heavy sense of moral duty on Hogarth at a young age and although he was not very religious himself his moral grounding did not leave him and is very apparent in his work. Having lived in debtors' lodgings whilst his father resided in jail, Hogarth had seen the harder side of life and brought a sense of gritty realism to all his paintings. What he believed to be the deterioration of British morals particularly concerned him and his satirical engravings in particular show his concerns for his fellow countrymen, presented in a humorous light. 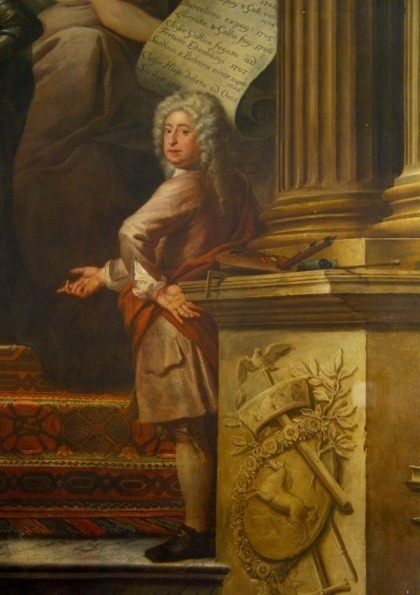 Hogarth's time as an apprentice with Ellis Gamble gave him a good grounding in the Rococo style which was very popular at the time. This decorative form came to epitomize Hogarth's work and he wrote about its importance in his published works, Analysis of Beauty. Hogarth was influenced by Flemish artists such as David Teniers and Ryckaert who often painted home interiors and galleries to demonstrate the patron's wealth. This was especially prevalent in the Rococo period as many of the European countries were attaining an abundance of wealth from their new colonies across the globe and many more people wanted to express their wealth through their possessions. Hogarth had a passion for art in all forms and would frequently portray the various scenes of well-known plays of the day through his painting series or engravings, making a visual spectacle and in the process redefining the concept of the visual narrative to the cartoon. 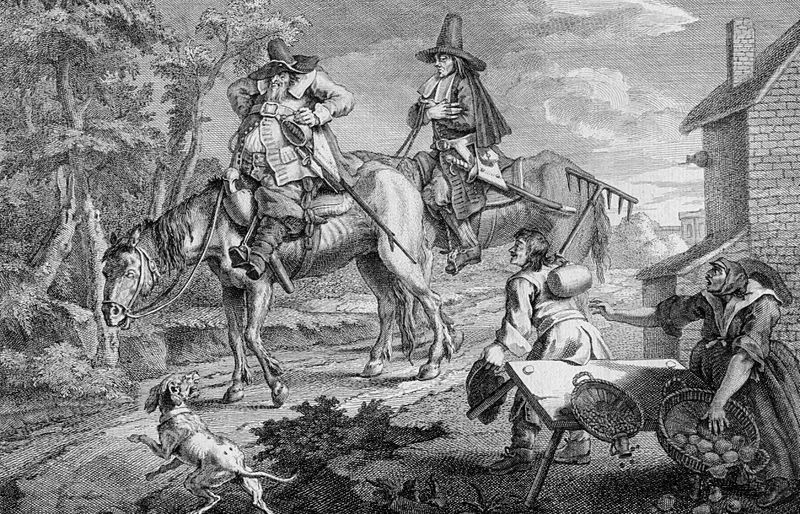 The first works that earned Hogarth recognition were his series of painting of Samuel Butler's Hudibras poems. This collection was noted for its excellent expression, the fine detail in the scenes and the symbolism that accentuated the narrative. Henry Fielding was a satirist and is thought to have influenced Hogarth's Beer Street and Gin Lane. 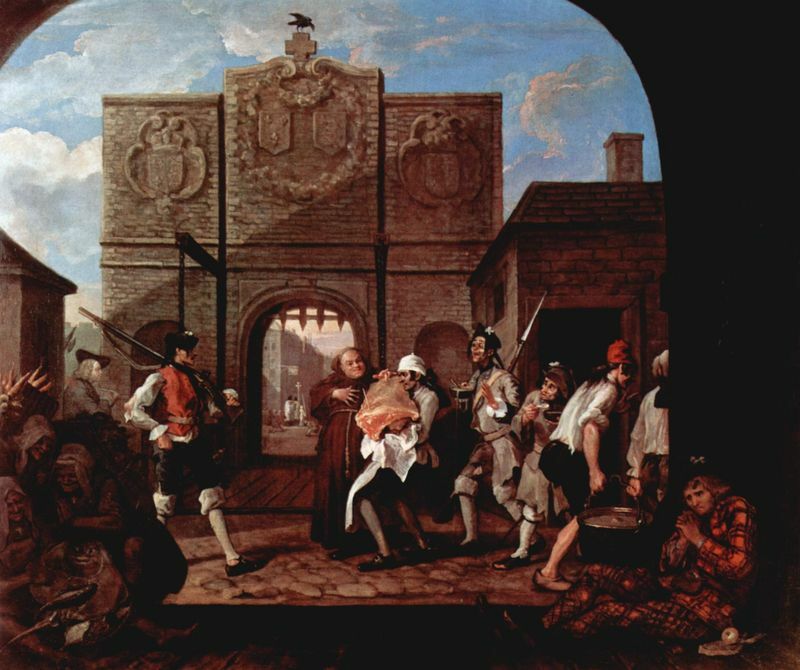 Fielding is thought to have enlisted Hogarth to produce these pictures as propaganda to raise support for the Gin Act of 1751, limiting the selling of spirits. 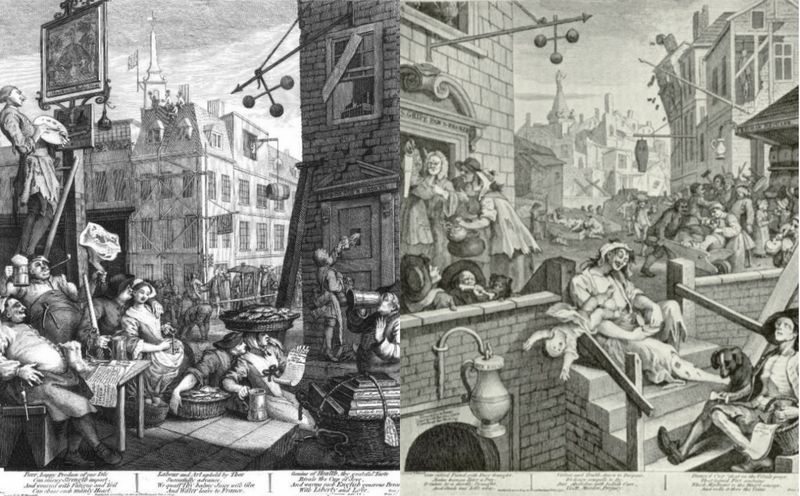 Hogarth's paintings were used in publications in support of the act, showing the ill effects of liquor such as gin. 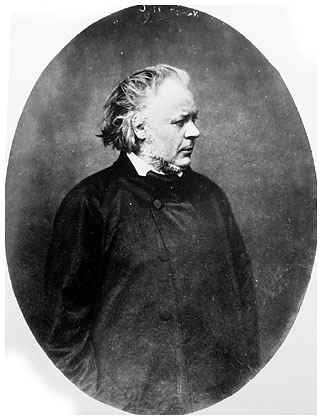 Collier, sometimes known as the Lancashire Hogarth, fashioned his career along the same lines as Hogarth, producing satires and poems of everyday life with strong moral and social values. Like Hogarth, Collier also had numerous etchings reprinted and some were so popular that they were put onto tiles for indoor decorations. The Pre-Raphaelite artists of the 19th Century were greatly influenced by the symbolism which Hogarth brought to his work. 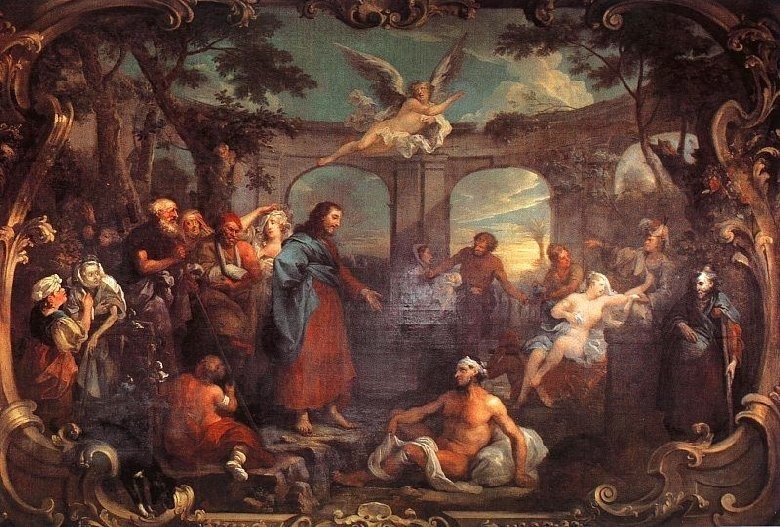 In work such as William Holman Hunts' The Awakening Conscience, Hogarth's influence is very apparent, with both artists using similar artistic practices to convey a moral message. 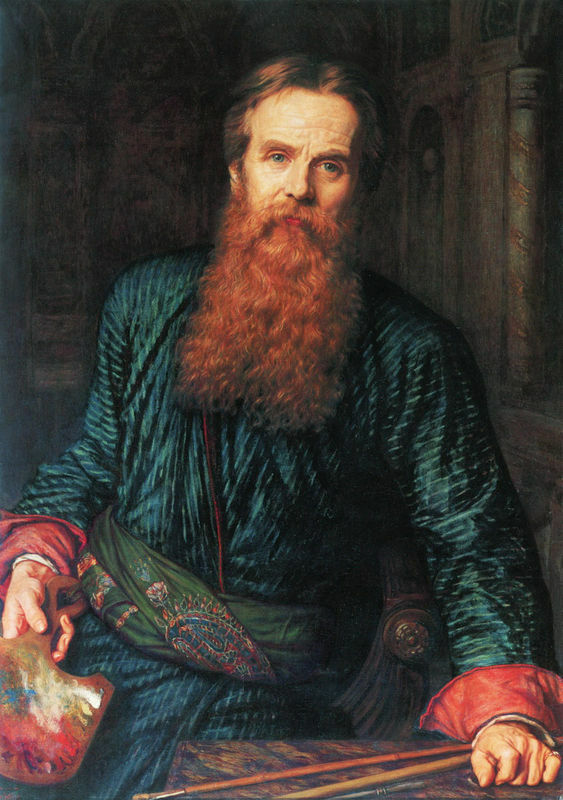 Many Pre-Raphaelite painters gained most of their profit from engraved work and cartoons that were reprinted and sold and thanks to Hogarth's work pushing the copyrighting act of 1735 through Parliament, they could earn a good living from it rather than relying on the patronage of the elite as other artists had done before them. 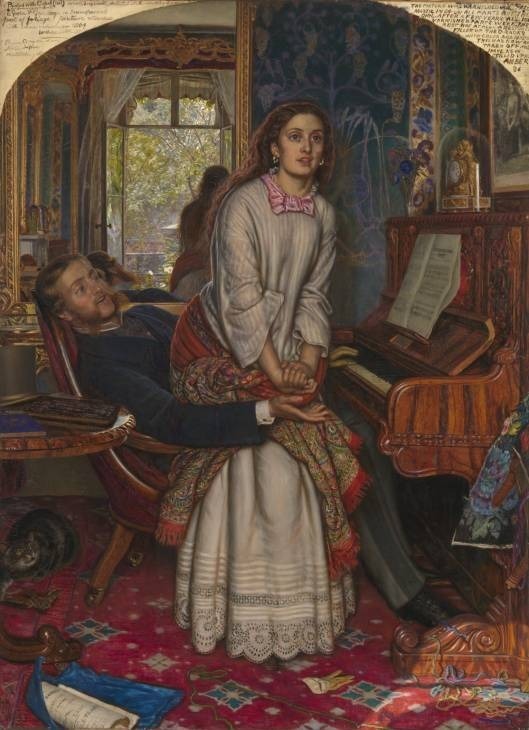 The Pre-Raphaelites also hoped to expand the ways in which the viewer interpreted art and expand an artist's subject matter in order to bring a wider range of issues to public attention. In this respect their work mirrors Hogarth's, as he produced work based on every day observance. 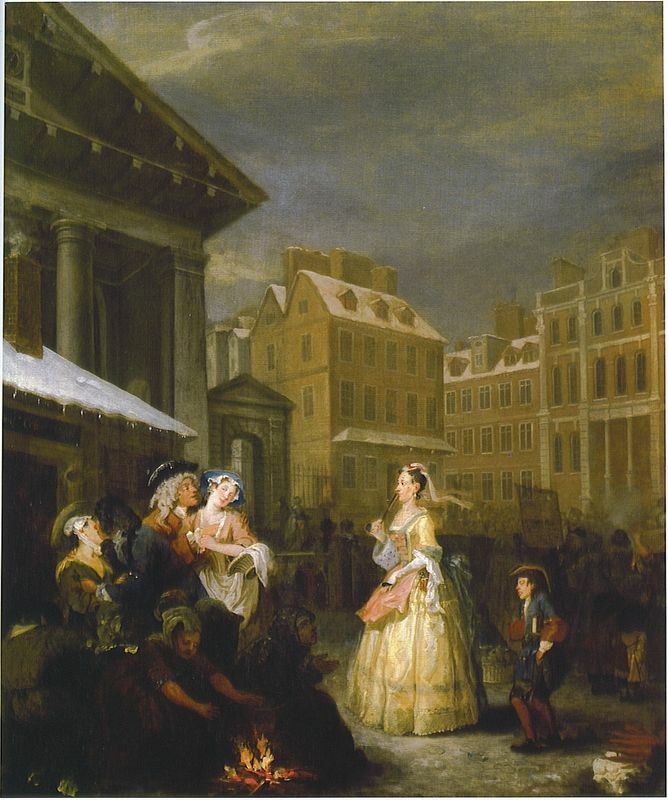 Realism is easily detectable in Hogarth's work and the scenes he portrays are often based on real-life events or places and have gritty, sometimes ugly aspects to them. Although such scenes were often exaggerated, people living in the 18th Century would undoubtedly have recognized problems and social vices from their own neighborhoods. As with later realism painters, Hogarth expressed his discern for the plight of people in everyday society, through his works. 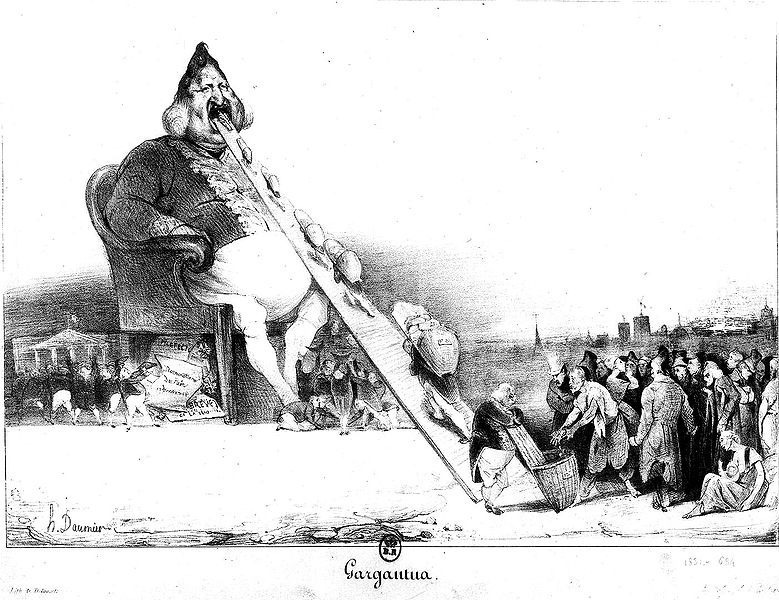 In 1931 Honore Daumier published the lithograph Gargantua which depicted King Louis-Philippe of France as a fat, greedy ruler. Daumier was actually imprisoned for publishing this work and although he never cited Hogarth as an inspiration, his work mirrors the satirical and moral justifications which Hogarth included in his prints, almost a hundred years before. 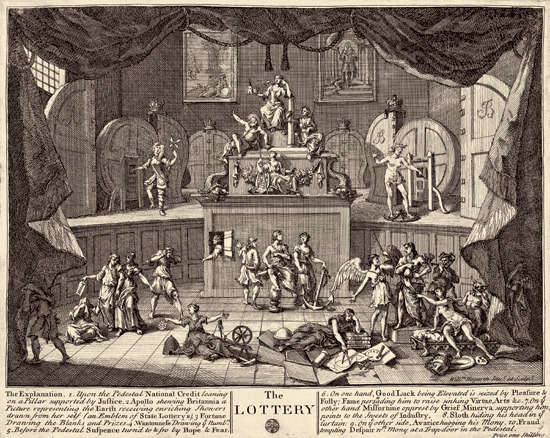 Hogarth's satirical works were most popular and can be seen as the first form of pop art that went on to inspire James Gillray, the political satirist and cartoonist who emerged in the latter part of the 18th century. 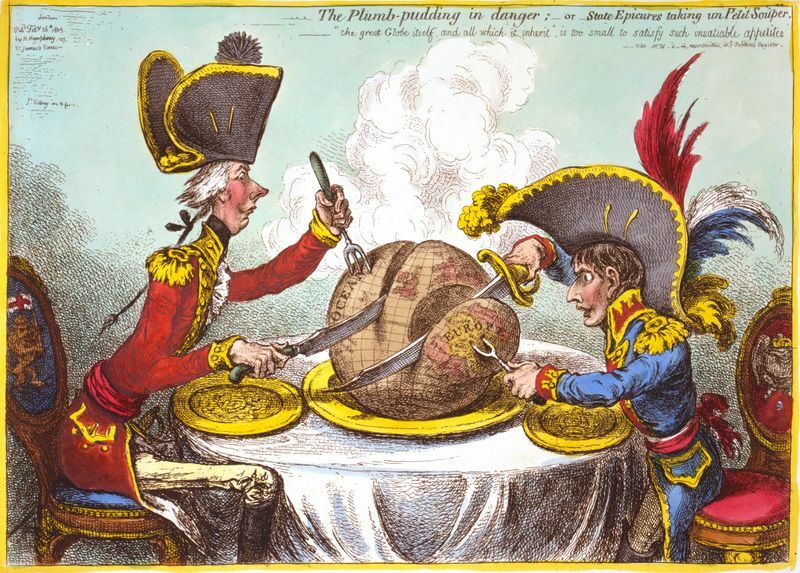 Gillray defined the comic strip template more acutely and used the medium to satirize the political situation in England at that time. The comic strip has become an important part of popular culture, the visual narrative accompanied by small amounts of text helping to make it accessible and comprehensive to all. By creating a visual and text media such as the cartoon as a form of satire, Hogarth took free speech to a whole new level. Even serious matters could be discussed openly in a humorous way. 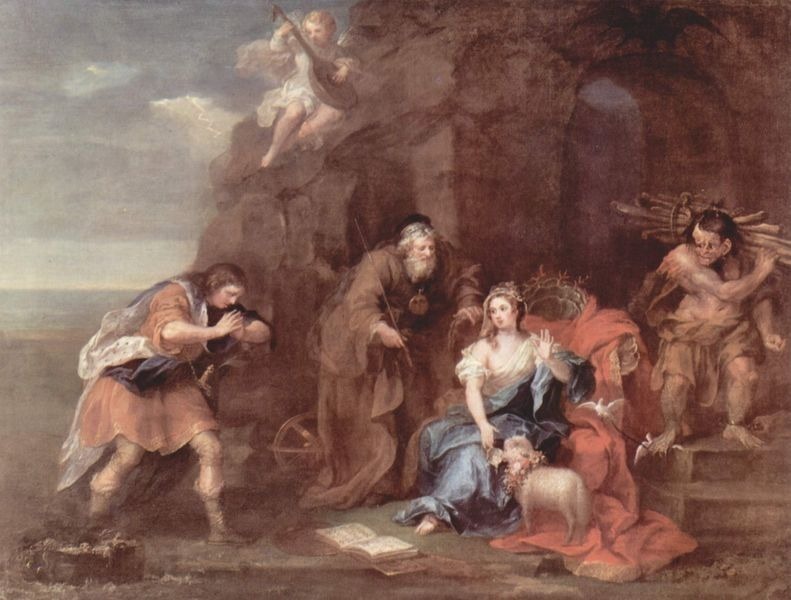 Hogarth's moral series were so popular that they had to be reprinted and were made into plays and pantomimes. 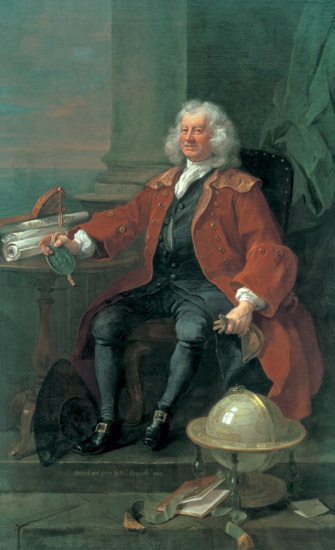 Hogarth's friends within the art world, men such as Fielding, believed that there was no-one better to represent the real London of the day but Hogarth.